BUKIT MERTAJAM: The Human Resources Ministry is encouraging technical and vocational education and training (TVET) institutions to provide night classes for the working class community. Its Minister M. Kulasegaran said the current operation hours were 8am to 5pm but the ministry encouraged the institutions to extend the operational hours for another six hours by remaining open until 11pm. “Eight to five are the normal working hours but we are now encouraging all TVET institutions to also operate from 5pm to 11pm to give opportunity for those working in nearby companies to continue their training to improve their skills. 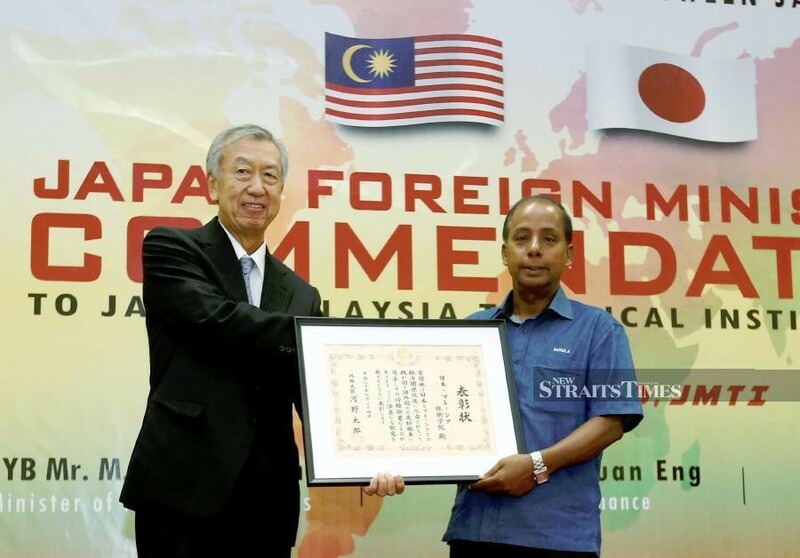 “This is being done in other countries including Japan and even here at the Penang Skill Development Centre,” he told reporters after attending a ceremony to celebrate Japanese Foreign Ministry commendation to Japan-Malaysia Technical Institute (JMTI) for promotion of economic relations between Japan and Malaysia at JMTI in Lorong Bukit Minyak here today. Also present were Finance Minister Lim Guan Eng and Japanese Ambassador to Malaysia Dr Makio Miyagawa. Kulasegaran said the ministry had also suggested to Japan International Cooperation Agency (JICA) to continue working with JMTI as a regional training centre that runs JICA training programmes for participants in this region. “I believe that this is significant as it lends credence to the name “Japan-Malaysia Technical Institute”,” he said. He said he hoped JICA would continue to dispatch technical experts and senior volunteers to share knowledge with instructors from local institutions. Meanwhile, Lim said in the Eleventh Malaysia Plan (11MP), it was targeted that the percentage of skilled workers would increase from 28 per cent to 35 per cent by 2020 but in order to achieve this, TVET sector needed to become a game changer so that it could easily meet the demand and requirement of the industry. “The target is to increase TVET students annual intake gradually from 164,000 in 2013 to 225,000 in 2020,” he said. Lim said government continued to place strong emphasis for improvement of TVET and had provided significant allocation for this year, totalling nearly RM170 million. However, Lim said the government could no longer afford to provide large allocations to public institutions with regards to capital expenses such as buying new machines and equipment. He said an effective public-private partnership was needed in which industry could share their resources such as machineries and technical expertise in order to help train more local students. “Now more than ever, it is crucial that the private sector comes forward and helps the government by sponsoring, or donating equipment or machinery to TVET institutions. “Alternatively companies may also provide opportunities for TVET students to be trained using machines and equipment available at their facilities,” he said. Lim said in other countries such India and Germany, there was specific legislation that compelled companies to participate in TVET. However, the Bagan member of parliament did not elaborate on whether the government had plans to implement such legislation. Lim said the government hoped that the industry and TVET institutions would voluntarily collaborate across their entire value chain of TVET, if possible from student recruitment to curriculum design, delivery and even job placement. “Companies should also consider offering scholarships especially for students to encourage more students to join TVET programmes. For this year, such contributions are eligible for tax deduction,” he said. Comment: Another option is to learn TVET courses via online (blended with workshops) that makes it easier for working adults to learn anytime, anywhere.